Download a blank fillable Application For Exemption From Institutional Oversight in PDF format just by clicking the "DOWNLOAD PDF" button. Complete Application For Exemption From Institutional Oversight with your personal data - all interactive fields are highlighted in places where you should type, access drop-down lists or select multiple-choice options. and is used to request an exemption. 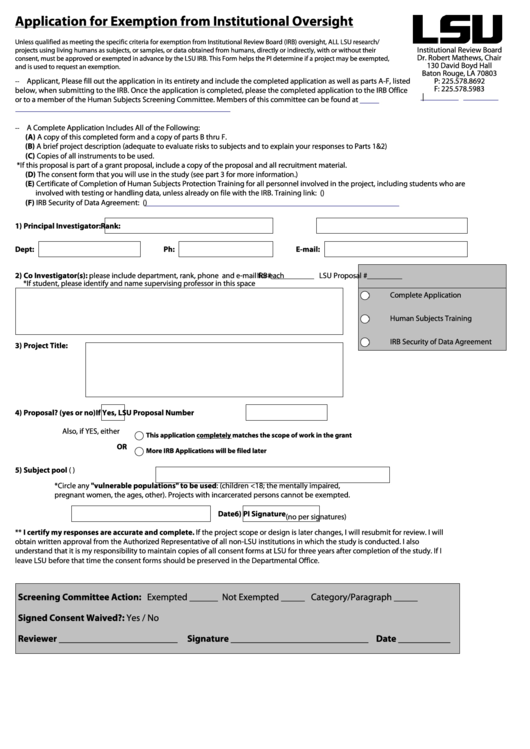 (A) A copy of this completed form and a copy of parts B thru F.
(C) Copies of all instruments to be used. *If this proposal is part of a grant proposal, include a copy of the proposal and all recruitment material. pregnant women, the ages, other). Projects with incarcerated persons cannot be exempted. leave LSU before that time the consent forms should be preserved in the Departmental Office.